After Mordecai exposed the plot of two of King Ahasuerus’ gatekeepers (as expounded upon in the first article), he was forgotten for a time. While the text leads readers to expect a reward for Mordecai’s service to the king, instead we are instantly treated to the abrupt promotion of haughty Haman, with no scriptural reason given for why Haman was honored in the kingdom. Hence, before we continue correlating themes in the Book of Esther with Ahasuerus foreshadowing Christ, Esther as His citizenry Bride, and the book’s deliverance as Messiah’s salvation offered to Jews escaping annihilation during the Apocalypse, first we will consider the forgotten man Mordecai as opposed to the king’s exaltation of Haman. For new readers, I, the scribe of MOTS articles, form my prophetic exegeses by taking historical events from the Old Testament (Tanakh for Jews) and interpreting symbolism, times, numbers, and names within them to determine who and what the people and themes in the stories foreshadow concerning Christ’s earthly ministry and His coming Great Sabbath Kingdom. In the last article, we correlated Mordecai raising and preparing Esther, to present her as a virgin bride and virtuous queen to King Ahasuerus, to Elijah the Prophet instructing the “Bride of Christ” and preparing the way for the true “King of Kings” (also a title of ancient Persian kings). According to the last chapter of Malachi, Elijah will prepare the people of God (Elohim YHVH) and turn back hearts, to avoid the earth being struck with “utter destruction” on the “Day of the LORD.” Christ also explained that Prophet Elijah will “restore all things,” even as John the Baptist prepared Jews for Christ’s first manifestation to the world (see Matt. 17:10-13); Jews of Judaism and the apostles of the first century continued to await the prophesied “restoration of all things” after the death of the Baptist (see Acts 3:20-21). So just as Moses prepared the Hebrews as a “wife” to meet God in the Old Testament, and thereafter wrote the Torah instructing them, Elijah must return to expound upon the mysteries that Moses wrote to prepare the Bride; the final preparation will be just before the “two witnesses” prophesy during the Apocalypse (see Rev. 11:3-12). King Ahasuerus is not killed in Book of Esther; otherwise, our story and correlations to Christ would be over. The book only alludes to Christ’s death with a plot by the gatekeepers to kill the King of Kings immediately before it switches track to the narrative of salvation of the Jews. Mordecai revealed the scheme to kill him, just as John the Baptist (in the spirit of Elijah) revealed that Christ would be killed as the “Lamb of God who takes away the sins of the world.” Of course, God could have allowed the plotters to kill the Persian king before resurrecting him to foreshadow the cross, but then the miracle of him being raised from the dead would have overshadowed the figurative Bride of Messiah (foreshadowed by Esther) petitioning the king for the salvation of her people, which looks to all of Israel being saved at the end of the age. With all these things in mind, we find that the foreshadowing story of Mordecai suggests that the deeds of Elijah, and his role in preparing the chosen people (like Esther was prepared) and announcing the sacrifice of Christ (“Lamb of God,” cf. Matt. 3:1-3, Luke 1:17, and John 1:29), would become largely forgotten or perhaps set aside before the Apocalypse comes and Jews and Israel are again targeted for destruction. Instead, Elijah, like Mordecai, would abide humbly at the entrance (the gateway) of the coming Kingdom, and another person or people would receive worldly honor and exaltation (as Haman) by the Great King of Heaven. First, we should take a look at the names given within the story. Haman means famous, and he came from the Agagite people, which means flames. His father’s name means double. For knowledgeable Bible students, the hint of double causes us to recall Prophet Elisha receiving a double (or second) portion of the spirit of Elijah. When we think of flames/fire, most of us immediately recall either the burning bush of God or the tongues of fire that descended from the Holy Spirit upon the apostles during Pentecost (Shavuot). As for the name Haman meaning fame or famous one (in correlation to the rest of these signs), it likely suggests the Gospel of Christ and His Kingdom being spread throughout the world, from John the Baptist, then from apostles of Christ, then from messengers to every nation. Hence, we know by the prophetic clues that Haman prefigured a famous leader in Christendom who would also be known by Jews. Second, concerning Haman, we find that he was given a seat above all his fellow nobles/princes in servitude to the king. Indeed, all the people of the Persian Empire bowed to Haman and paid him homage. Thus far, the available clues lead me to believe that Haman foreshadows either (1) the Antichrist soon to be exalted over all Christian nations, preparing to persecute Jews of Israel and supporting Christians, or (2) the Bishop of Rome; for centuries papal heads sat in a seat higher than any other religious leader who claims Christ as their King (i.e., having the most followers and influence in the world). According to Revelation, the world will bow before the Antichrist and pay him homage, but thousands of the billion-plus Catholics already bow before their “Pope” and pay him homage at the Vatican. Readers, of course, can develop their own parallels and theories to identify tyrannical figures as we continue, but remember that a perfect correlation is one that incorporates all symbolism and clues given within the passage by God. Many Jews saw (and still see) Hitler as a recent Haman figure; Hitler apparently caught the connection to himself, as evident by a speech he gave in January 30, 1944 in which he said that Jews would have “a second Purim” to celebrate if his Nazis government lost WWII. Also, like the ten sons of Haman who were eventually hanged, purportedly, ten Nazis were hung on October 16, 1946 after sentencing during the Nuremberg Trials. Hence, we can have imperfect types of Haman, but the full embodiment should perfectly fit biblical details. Hitler actually carried out the systematic slaughter of millions of Jews (and others deemed enemies or genetically undesirable by Nazi eugenicists), unlike Haman who succeeded only to the extent of giving an order for Jewish annihilation. Moreover, Hitler could not fulfill any sort of panoramic pattern in the precise manner that we who study prophetic parables would expect with the available parallels. Hitler was one of several types of antichrists, but the final Antichrist will be prevented from destroying Israel when Christ comes to establish His righteous throne. According to the propaganda of some Nazi officers, they sought to prevent tens of thousands of Germans from being slaughtered by conspiring Jews- asserting that Jews would repeat the slaughter of Persians on the German populace, as they avenged themselves of Haman and his family. Nonetheless, the resounding storyline of Esther is one of complete salvation, so we look to the coming Apocalypse for fulfillment of the shadows, when the “Deliverer” comes so that “all Israel shall be saved” (see Rom. 11:25-27). Remember, the “King of Kings” Ahasuerus saved Jews, prefiguring Christ at the end of the age, but during the Holocaust Jews were led as sheep to the slaughter. Finally, from the above passage, we find the palace gatekeepers’ animosity building towards Mordecai, which would lead to Haman finding out his lack of submission and also hating him. Mordecai, faithful to Elohim YHVH, would not bow to him nor anyone except his God. From the Book of Revelation, we know that the Antichrist and the world will hate Elijah and Moses when they refuse to submit to their humanist system and worship of the Beast. We also expect many Christians with different eschatological beliefs (and probably many secular Jews and rabbis) to hate them and scorn their resistance; also, the Bishop of Rome will probably despise them and their prophesying. Israel, however, will protect the two witnesses for a period of time until the Beast tries to destroy the little nation, beginning at the controversy over the Temple and Jerusalem as the nation’s capital city. The prophetic progression of the book- from forgotten preparer of the Bride, to hatred for Elijah for not submitting, to the Beast wanting to destroy the Jewish people- is perceivable as the story of the forgotten man Mordecai unfolds. Remember that God saved Elijah and seven thousand who had not bowed a knee to Baal, and the Lord YHVH will save those who refuse to bow to the Antichrist and receive the “Mark of the Beast.” With the Book of Esther we are granted more pieces of the prophetic puzzle for the panoramic picture of messianic redemption and deliverance of the elect. The first thing we find is that the king’s gatekeepers pressured Mordecai daily to bow before Haman, the royal vizier, but he would not listen to their words. The second thing we notice is that they wanted to see if Mordecai’s words would stand when put to the test. During the Apocalypse, religious people will utilize Scriptures and rhetoric to pressure the two witnesses to bow down to the Antichrist, and the prophecies and eschatology given by the two anointed ones will be tested as the Beast rages against them. Before that time comes, Elijah’s words and the appointed times (moedim) he expounds will be challenged as he seeks to prepare the way for Jewish salvation through Christ. In Esther, this conflict comes to head during the twelfth year of King Ahasuerus, and this is because it foreshadows the elect of all twelve tribes being restored, at the end of 12,000 years since the beginning of Genesis. Remember, King Ahasuerus was a type of Christ, so the years of his reign are comparable to the Messiah’s work of deliverance through millennia, in forming a holy citizenry and Holy Kingdom that will be manifest on Earth at Jerusalem. For Haman, there could be no reasoning over the times of God and the destiny of His people; he and his officials would simply cast lots in the air (purim) and let fate determine the time of destruction for Mordecai and the Jews. Whatever they landed on, they landed on, for there was no higher meaning to consider. It was natural selection and survival of the fittest, where the strong callously decided the death of the small and weak. For them, deciding a date for Jewish fate was little different than people today randomly picking lottery numbers or placing an impulsive wager, rolling dice in hope of winning. Like the Antichrist and his followers, they did not care to reason over the signs of the times from a Jewish-biblical perspective; everything was random and left in their hands to casually do evil as they pleased. Their attempted annihilation of the Jewish people was complete opposite to Moses meticulously appointing Divine holy days and times of fasting and purification for the salvation of the nation. According to the Latin Vulgate and Masoretic Text, the lot fell on the 14th day of Adar, which is the twelfth and last month of the sacred calendar but sixth month (middle) of the secular calendar. Considering both calendars together (12 and 6), where man’s will for destruction attempts to trump God’s decree of salvation, it fell on 666. 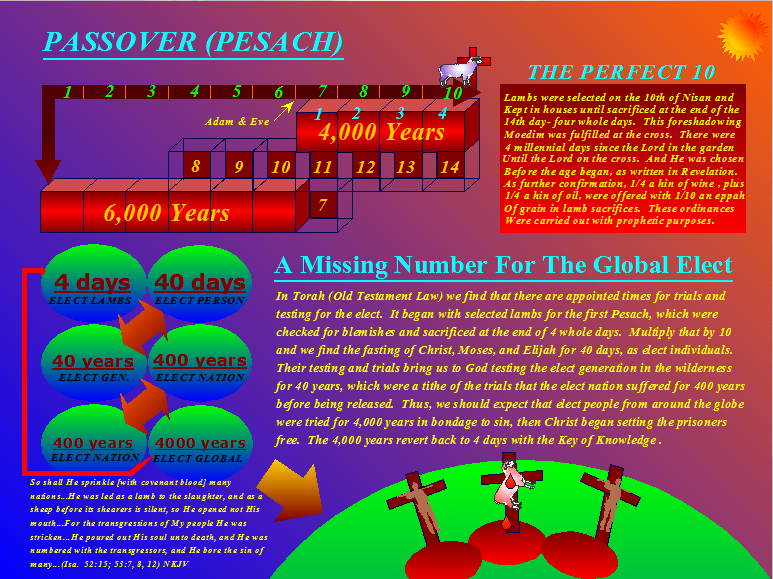 On the 14th day of the first month (sacred calendar), lambs were sacrificed for Pesach (Passover), but here we find that the lots fell on the 14th day of the last month rather than the first month; this points to the end of 12 Divine days, when the Beast and False prophet will pay for their own sins. When the Temple of YHVH stood in Jerusalem, the High Priest (Kohan haGadol) would cast lots to decide the fates of two goats during the Day of Atonement (Yom Kippur). One goat would atone for the collective sins of the people, as a sacrifice, and the other one would be allowed to escape into the wilderness despite the sin placed on him (a.k.a. the scapegoat). What this means from a panoramic perspective is that Christ, the Lamb of God, would die for our sins, like a goat sacrifice, providing us an escape from death, just as Israel escaped death in Egypt by fleeing to wilderness. The Egyptian troops, however, were killed when the water of the Reed Sea came down upon them. For Christians, we know that the Day of Atonement was fulfilled when Christ was chosen for crucifixion on Passover by the High Priest and chief priests, but the murderer Barrabus was released to live and go free (see Matt. 27:20-21). 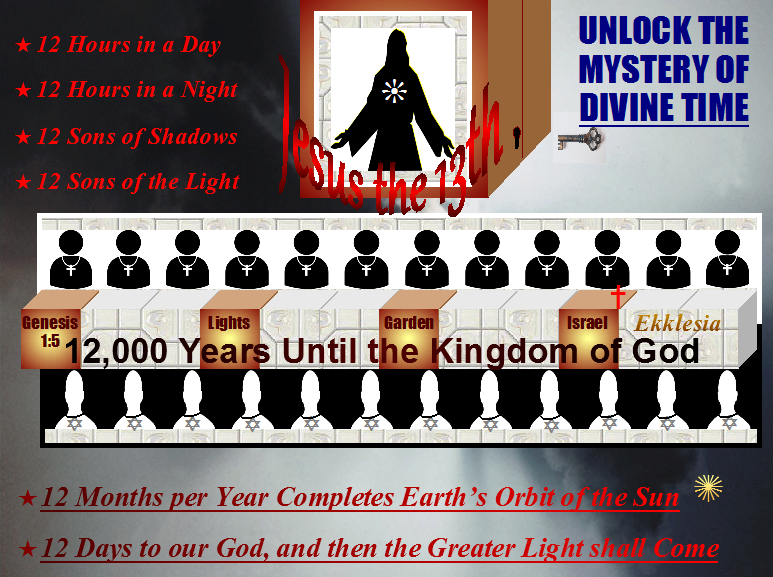 However, God’s enigmatic truths ripple, and during the Apocalypse the chosen children of Israel (a.k.a., “Body of Christ”) will escape Satan in the wilderness as the body of the Antichrist troops will be slain (see Rev. 12:14-15). The Bishops of Rome, in particular, suppressed their worship for centuries. Between 395-423 A.D., Flavius Augustus Horprius (among others) even prohibited them from keeping Purim, for in their ignorance they mistook their reenactment of hanging Haman (erection of an effigy that was burned) to be an insult to Christ on the cross. Further, rabbis were at times restricted from interpreting Scriptures after reading them in synagogue. The 10,000 talents of silver that Haman offered to reimburse the king, while petitioning him for the annihilation of Jews throughout the kingdom, is not a random number, although it may have been in Haman’s mind. Joseph was sold for silver to Gentiles by the sons of Israel. Samson, deliverer and judge, was also sold into Gentile hands for silver. And, of course, Christ was sold into the hands of the Roman Gentiles by priestly silver paid to Judas Iscariot (cf. Ex. 30:16; Zech. 11:12; Matt. 26:15). Here, however, we find haughty Haman willing to pay 10,000 talents of silver to destroy all Jews. Rather than Christ Yeshua dying for their sins at 10,000 years from the beginning of the age (six millennial creation days plus four), Jews were left without a deliverer to die in their place (or so they at first thought). Joseph was given the signet ring of authority from the king of Egypt, and he saved his people. And Christ was given the seal of God (the Great King) to save the elect of the world. 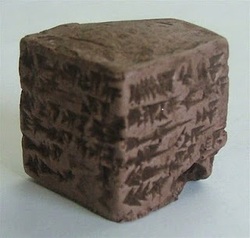 In this story, however, the seal of the king was given to Haman to destroy the Hebrews left from the House of Judah. For a moment, Satan, the true enemy of the Jews, appears get his way with them, but only for a mere moment in the historical picture that was orchestrated by God. The question should arise in many readers’ minds as to why- if King Ahasuerus foreshadows Christ- he would send out a script decreeing the utter destruction of the Jewish people. To answer this, we must first discern that this script and commandment of the King parallels Holy Scriptures- the Word of God, with all its laws and judgments. The whole world is God’s province, and the Messiah is governor among the nations: King of Kings and Lord of Lords. Hence, the letter going out in all languages, for all the nations/peoples of the empire, prefigured God’s Word spreading around the world, in all nations and languages. Further, we should discern that God has warned of utter destruction if His people rebel and do not keep His laws and commandments; indeed, there is a warming of this “utter destruction” if hearts are not turned back to God at the words of Elijah. Again, the Word of God- Divine decrees from Heaven- serve to both warn of destruction of the rebellious and declare salvation to the faithful, dependent upon how the people respond to His Word. In fact, when the Antichrist comes, there will be a period of persecution against the people of God, as decreed in His Word (cf. Dan. 8:23-25; 11:33-36), until the people are refined in Spirit and turned back to their Maker. As for the timing, with the decree pronounced on the 13th day of the first month (Nisan), and set for fulfillment on the 13th day of the twelfth month (Adar), we first discern that it begins the day before Passover on the sacred calendar (the Pesach, Nisan 14th); this was the day Christ was betrayed into Gentile hands to be sacrificed for the Jewish nation (and for all who would come to believe). 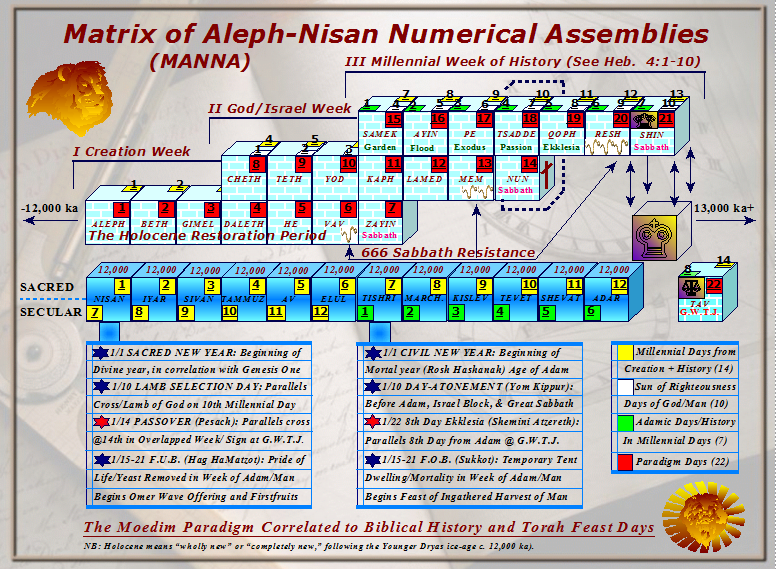 From a panoramic perspective, the 13th millennial day is the Day of YHVH- a day that begins with His judgment on the rebellious nations (see the Moedim Paradigm above). The 12th month marks the end of twelve great days in this age. Hence, the sum of the message suggests that those who do not accept the Lamb of God, who was appointed as an acceptable Sacrifice before this age began, are left with utter destruction as their ultimate judgment. The first and last month look to the “Beginning and End” and the “First and Last.” (See Revelation 1:8, 17.) So the Jews were accused of lawlessness, set to destruction by Satan, even as Haman accused them of lawlessness in the foreshadowing story (3:8). Nonetheless, all who find Christ will be saved in the end. Remember from the previous article, the word Shushan means lily and trumpet, and the white palace of the king suggests that the decree signifies a greater warning given from Heaven by the Great King. Judgment of Jews was passed with the King’s Word after accusations of lawlessness by Satan (i.e., the adversary), prefigured in the story by Haman. Hence, they sat in judgment, drinking, which symbolizes the cup of God’s wrath against rebels. Meanwhile, the city was astonished in confusion, and this looks to Word of God against Jerusalem and the Israelite people when the judgments of God are poured out (cf. Jer. 3:25; Dan. 9:7-8). Nonetheless, our story is far from finished, for the Sword of the Spirit is about to be flipped with the edge of grace and salvation facing the Hebrew people. The enemies of the children of Israel, who ruled harshly over them, were perplexed when the Messiah sent out His messengers with the Gospel of healing to the Jewish people and the coming Kingdom of God (see Luke 9:1-9). The same Word of the King provides them a means of atonement. Hence, the end of the story is one of salvation and glory, when the people of God turn back their hearts to their Creator and petition Him for salvation from the King of Kings and Lord of Lords. As written earlier, Mordecai’s plight was a prelude to Prophet Elijah- the messenger who is sent to prepare the hearts of the people as a Bride (people in covenant with the Lord) readied for Messiah. In the Book of Revelation (11:3-4), we are informed that he and glorious Moses will prophesy in sackcloth in the city of Jerusalem. The story of Purim is a story for the end of the age, when Elohim YHVH atones for Israel by the blood of Messiah, even as He promises to “cleanse their blood that I have not cleansed” (see Joel 3:2-21), and the “two witnesses” will bring this message like never before to the Hebrew people. They will essentially serve at the gate- the entranceway of the Great King. The symbolism and fulfillment of this passage is probably self-evident to many readers by now, but I will explain it nonetheless. Elijah will explain the ten thousand pieces of silver that the people of God need to cover by the sacrifice of Christ. Believers must go before the throne of the Great King, before the Messiah, in prayers and supplication for salvation, which is the meaning behind the story of Mordecai directing Esther to appear before King Ahasuerus with petitions of salvation. Salvation of Jews during the Apocalypse is dependent upon them turning back to the Lord and heeding His instructions for an escape, even as all people must do throughout the world. And, as seen in the story, Israel will be saved, even if leaders of the churches and synagogues resist the Divine message. All these things have been explained over and over again, but the question remains as to how many covenant people will hear what is written. 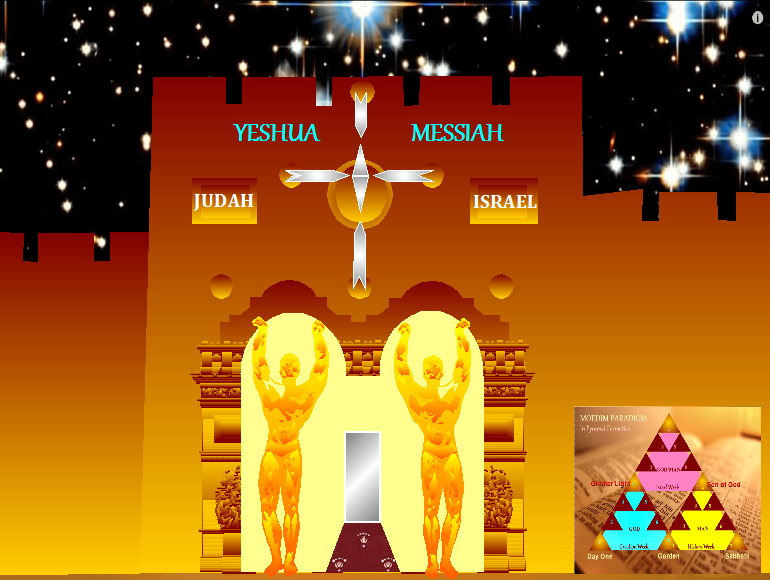 The golden scepter of the Persian “King of Kings” alludes to the Messiah’s Divine kingship from the tribe of Judah (the Jews or Judeans); as written in Gen. 49:10: “The scepter shall not depart from Judah, nor a lawgiver from between his feet until Shiloh [Prince of Peace] comes; and to Him shall be the obedience [decreed assembly] of the people.” The “inner court” in the passage refers to the Jerusalem Holy Temple of God where the priests (kohanim) conducted sacrificial services under the Levitical law; the Outer Court was where all the people could legally gather without breaking the Law (Torah ordinances), which was punishable by death in the days of the Temple. Together these things indicate the fact that many rabbis and people of God will resist conducting Temple services and making petitions for the nation before God, calling it illegal, because- as they often say- the Messiah must come first and rebuild the third Temple (described in the Book of Ezekiel) and call the Temple priesthood and the gathering of the people. However, they also teach that Prophet Elijah must come first to prepare the way before the King and lead the people into proper priestly conduct, and in the eleventh chapter of the Book of Revelation we find that the Temple is under construction when Moses and Elijah begin their prophesying in Jerusalem. Further, the Book of Daniel mentions the daily sacrifices before Messiah comes (see Dan. 9:27). In conclusion, the text suggests that at the words of Elijah (as Mordecai instructing Esther), the covenant Wife will petition God at the Temple. As for the 30 days in which Esther had not been called to the King’s presence, to his inner court, it also alludes to the priesthood. According to the Torah, the Levite priests had to reach a maturity of 30 years before they could serve before God- the King of all tribes of Israel (Num. 4:43). The passage suggests severity in appearing before God and hesitancy in standing in His Presence, because of such a lengthy absence from their ministry service and petitions. After all, 39 Jubilee Years will have passed since the last Temple services were conducted, with the Temple destroyed by the Romans c. 70 A.D., so the Temple Institute and concerned Jews are cautious in their efforts to achieve perfection in the ordinances of the Law before standing in service before God. This is the message from Prophet Elijah in which we discern from Mordecai: There will be no escape for some in a rapture whereas Jews in Israel are left in persecution. Christians will not feast in a marriage supper with Christ in Heaven as the nation of Israel faces annihilation. Nor will indifference and silence during the Apocalypse save those who refer to themselves the “Bride of Christ” or “spiritual Israel” or whatever name they may call themselves. We have come to doors of the Kingdom for a time such as this, an appointed time in the history of the world, and God will destroy the houses of worship that refuse to proclaim the truths of His coming Kingdom and the Gospel of His Salvation. Judgment begins in the House of God, from Jews to Gentiles, and He is no respecter of persons, no matter who their fathers or forefathers or patriarchs or matriarchs may be. 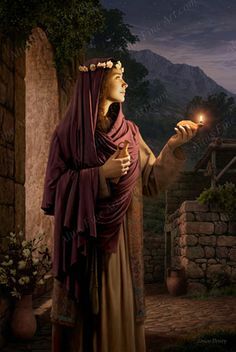 Queen Vashti was cast out for not answering the call to appear before the king, but Queen Esther answered the call from Mordecai, although she feared that her lord had not called her. And this is the difference between Babylon and the true covenant citizenry of the Great King. From this, we find that there will be a gathering of all Israel unto Moses and Elijah, which is the Sukkot gathering for the return of the Great King. And He will return to deliver His people on the third day (see Hos. 6:1-3), and we shall live in His sight. Below, at the end of this article, I, Levi, added the “Prayer of Mordecai” according to the Greek Septuagint, for it shows ancient Jewish thinking in correlating Esther’s petitions to King Ahasuerus (for salvation of the people) to Jews petitioning God, the true King of the Jews. I did not add the so-called “Prayer of Esther,” which, even as a fraudulent work of prideful Jewish rabbis, has no literary value to readers; it sullies Esther’s virtuous character rather than exemplifies it, all in order to insult Gentiles and King Ahasuerus. In the final, upcoming article on Esther, I will summarize the rest of the little book (remaining six chapters) rather than taking a line-upon-line approach in making correlations to Christ and details of the Apocalypse. Mordecai prayed to the Lord, calling to mind what the Lord had done in the past: “O Lord, you are the Lord and King of all creation, and everything obeys your commands. If you wish to save Israel, no one can stop you. You made heaven and earth and all the wonderful things on earth. You are the Lord of all, and there is not one who can stand against you. You know all things. You know, Lord, that when I refused to bow to that arrogant Haman, it was not because I was arrogant or trying to impress people. I simply did not want to honor any human being more than I honor God. I refuse to bow to anyone but you, my Lord; and this is not because of pride. If it would help to save Israel, I would be willing even to kiss the soles of his feet. And now, O Lord, God and King, God of Abraham, spare your people; save us from our enemies. they are determined to destroy us; they are looking for a chance. Long ago you chose us to be your people and rescued us from the land of Egypt. Do not abandon us now. We are your chosen people, so listen to my prayer and be gracious to us. Turn our misfortune into joy so that we may live to sing your praises. Save us from death so that we can keep on praising you.” And all the people of Israel prayed loudly and earnestly because they were sure that they were going to die. (Esther C:1-13) Sept.